This 60-mile loop route was one of the featured routes at the 2016 Monticello Bike Fest. It is very similar to the Monticello, FL Century Loop, but cuts out the second half of the figure-eight from the Monticello Century Loop. Starting in historic downtown Monticello, the route features canopied roads, rolling hills and Wacissa Springs. The route takes the scenic Ashville Highway up to the edge of Ashville, FL. In the northeast corner of this figure-8 route, users may follow Ashville Highway all the way to its intersection with U.S. 221, and then turn right (south) on U.S. 221 to avoid Gum Swamp Road, which is a dirt road. Once rejoining U.S. 221, the route heads south, turning right at Jefferson County Road 243, past Lake Logan and the Honey Lake Resort. 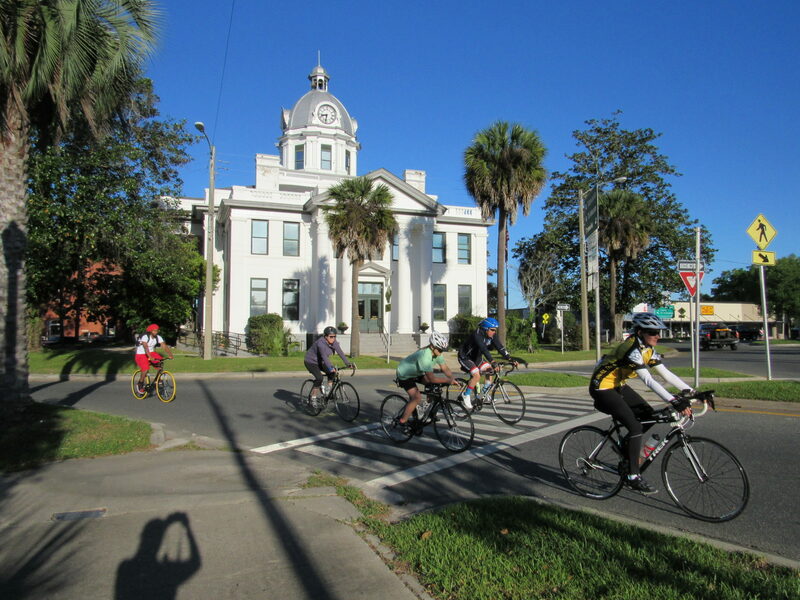 The route then turns right on U.S. 90, which is part of the Adventure Cycling Association Southern Tier Route and proceeds past the Upper Aucilla Conservation Area. The route makes a sharp right turn onto Jefferson County Road 257 /Bassett Dairy Road and returns to downtown Monticello. From Monticello, the route proceeds past Lake Miccosukee, providing scenic, canopied roads around miles 44 and 45. The route makes a turn to the north along rolling, country roads, where riders pass open fields and farms. It eventually travels south to return in downtown Monticello. Monticello has several nice bed and breakfasts for those planning to spend the night to ride the Monticello Century Loop. Check out the Avera Clarke Bed and Breakfast, the Cottage Bed and Breakfast and John Denham House.